Opening night has come and gone - 24 teams - DOZENS of players - lots of excellent plays and hustle.. this is going to be a great season! If you find your team scheduled against Johann Sebastian Block, you'll get to meet this week's player of the week, Yashar. Yashar exudes the Undersog Spirit- affable, social, hustle, and a willingness to pitch in! 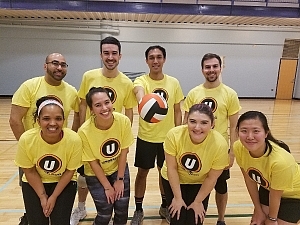 No stranger to Underdog volleyball, Yashar made some clutch plays to help his team get a win during their competitive match. Great work out there, Yashar!